You can recognise your AdBlue® tank by its blue cap or an AdBlue® label, but it is a totally separate tank. The filling point is often fitted near your diesel cap. Some passenger cars have an AdBlue® tank in the boot or in the engine bay. 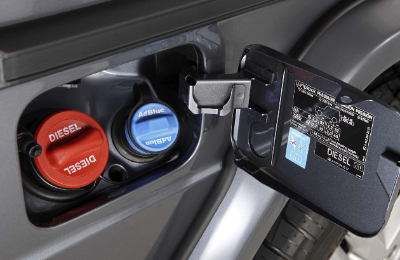 The opening for your AdBlue® tank is narrower than the opening for a diesel tank, so you should not be able to put diesel in the wrong tank (the nozzle does not fit). What do I do when I have spilled AdBlue®? AdBlue® is not dangerous to the environment. A small AdBlue® spill can be diluted with water. It is best to mop up the spillage and avoid flushing it down a drain or waterway. In case of a large spill, try to prevent the spillage from entering drains or waterways. Contain the spill with sand, earth or your spill kit and dispose of it properly. Spill kits are available in different sizes and sets. Note: The surface on which you spill AdBlue® may become slippery. Make sure that you clean up the spill as quickly as possible to prevent slipping and falling. Can I reuse spilled AdBlue®? No, never try to reuse spilled AdBlue®! Spilled AdBlue® will always be contaminated. Using contaminated AdBlue® can cause costly damage to your vehicles’ SCR system, so no matter how great the spill, you cannot reuse it!